Suffrage Stories: What else is in Emily Wilding Davison’s grave? A while ago I acquired a small collection of items that had once belonged to Mrs Mary Leigh, the leader of the WSPU fife and drum band and close friend and life-long supporter of Emily Wilding Davison. Among these was a copy of Walt Whitman, Song of the Open Road, published by the Arden Press, Letchworth (1912), containing a lengthy inscription by Mary Leigh on the free front endpaper. From studying the handwriting I deduced that her comments had been made at two different times – probably decades apart. At the top of the page is an ink inscription ‘From E.W.D. 1912’.- which, I think, was not a presentation inscription from Emily Wilding Davison, but a note by Mary Leigh to commemorate the gift to her. The Emily Wilding Davison archive held by the Women’s Library contains another volume of Whitman’s verse, given by ‘Comrade Davison to Comrade Leigh’. Whitman was clearly a favourite, a poet who spoke to the women – eulogising their bond of close comradeship – and in The Song of the Road Mary Leigh, as in the Whitman in the Women’s Library, has annotated particular verses with some vehemence. The little book itself had clearly been well used; laid in the title-page fold of this copy was a pressed flower. However it is another piece of information that Mary Leigh added to her endpaper writings that particularly interested me. She wrote: ‘I placed one [i.e. 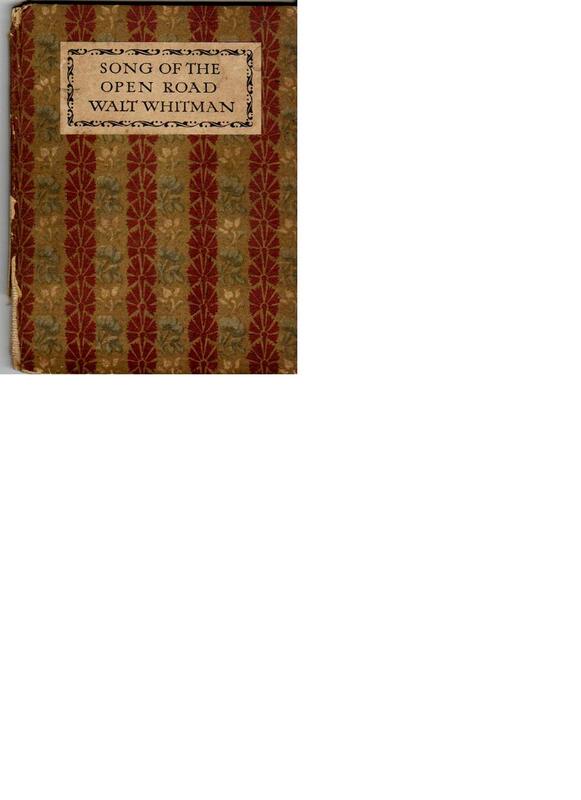 a book] like this from L C. Lytton in E.W.D.’s hand. ‘ In biro, at a later date, as though giving a fuller explanation, she has amplified these details – so that the whole now reads: ‘1913 June 14 in her coffin at Epsom Mortuary I placed one like this (Walt Whitman) from L C. Lytton (Lady Constance Lytton) in E.W.D’s hand open at the page she loved so well. I also placed her Hunger Strike Medals and the 8 Bars of Forcible Feeding also the Medal of Jeanne D’Arc to Fight on God will give the Victory’. ‘Fight on God will give Victory’, Joan of Arc’s assurance, given at her trial, is the message emblazoned on the banner carried at Emily Wilding Davison’s funeral, both in London and then draping the grave in Morpeth. 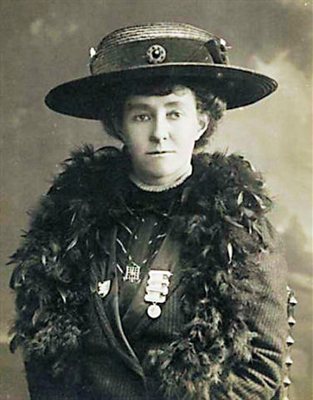 Here is Emily Wilding Davison wearing her Hunger Strike Medal, with still, I think, four bars, each commemorating a hunger strike and consequent episode of forcible feeding. Further imprisonment lay in the future. It is interesting that Mary Leigh specifically writes of ‘Medals’ in the plural. As well as the Hunger Strike Medal, with its 8 bars, she may have been referring to the ‘Holloway’ badge, received for an earlier imprisonment, that Emily is wearing in the photograph. In addition, I suspect, but cannot be sure, that she may also have, pinned on her other lapel, a WSPU ‘Boadicea’ brooch. However I have not yet been able to deconstruct Mary Leigh’s mention of the ‘Jeanne d’Arc’ Medal’. As far as I know there was no WSPU medal directly associated with Joan of Arc – although, 1912 having been the 500th anniversary of her death, she loomed large in the popular – particularly suffragette – imagination, Elsie Howey rode as ‘Joan of Arc’ in Emily Wilding Davison’s funeral procession. It may have been that EWD particularly treasured a medal – there were many issued – acquired in the quincentenary year. Mary Leigh remained Emily Wilding Davison’s champion for the remainder of her life. Out of a meagre income she arranged each year for a Morpeth florist to supply an expensive bouquet of flowers and travelled north every June- even well into old age – to lay them at EWD’s grave in St Mary’s Churchyard. The rather pathetic correspondence concerning these arrangements may be read in the Mary Leigh Papers at the Women’s Library. The florist was a credit to her profession, entirely kind and helpful. Little would Mary Leigh have expected – although she may well have approved (you can never be sure – she was a contrary character) – that into the 21st century EWD’s grave would have become a shrine – the plot now immaculately restored. So many myths have accrued to the memory of Emily Wilding Davison that it is something of a relief to be able to produce a piece of primary evidence, in the form of this copy of Song of the Road, that allows the visitor standing in front of the Morpeth obelisk to picture, with some assurance, the moment in the Epsom Mortuary as Mary Leigh laid in the open coffin Lady Constance Lytton’s copy of this small volume of verse, together with the hard-earned Hunger Strike Medal. This entry was posted on August 6, 2012, 12:17 pm and is filed under Suffrage Stories. You can follow any responses to this entry through RSS 2.0. You can leave a response, or trackback from your own site. I would be very interested in finding out more about the items that belonged to Mary Leigh that you have. I am a feminist writer and am working on a novel set within the suffragette movement which features Mary Leigh. I have previously visited the Women’s Library and seen the items in the Emily Wilding Davison archive, including the Walt Whitman collection that you refer to. Apologies for delay in replying – I’ve been away for a few days. I think it would probably be best if I reply to you by email. Fascinating, although so sad. I have been trying to track down an orbituary for Emily W Davison, I’m sure it was Olive Schreiner who wrote it, and also possibly in a book called Feminism’s; A Reader (?) But I’m not certain and haven’t been able to track it down. It made me cry, unexpectedly, not an easy thing to do.